Don't have any plans for the Halloween holiday? Well, now you do. If you're a super fan of Benedict Cumberbatch, you're not going to want to miss what Fathom Events has set up for October. The Doctor Strange and Sherlock star is taking on the role of Frankenstein's Monster, and it's something you're definitely not going to want to miss. Frankenstein comes alive in U.S. Cinemas, in time for Halloween, this October for a two-night event, In celebration of the 200th Anniversary of Mary Shelley's classic novel. And here, you never thought you'd get to see Benedict Cumberbatch suffering in pain as horror's most notorious creature, built from human body parts and unleashed on an unexacting world. Fathom Events, National Theatre Live and BY Experience bring Frankenstein, first captured live in 2011 from the National Theatre stage in London, back to cinemas for a two-night event, October 22 and 29 only. This thrilling, sold-out production became an international sensation, experienced to date by more than half a million people in cinemas around the world. Frankenstein is a live stage production captured in high-definition, and directed by Academy Award-winner Danny Boyle (Trainspotting, Slumdog Millionaire). 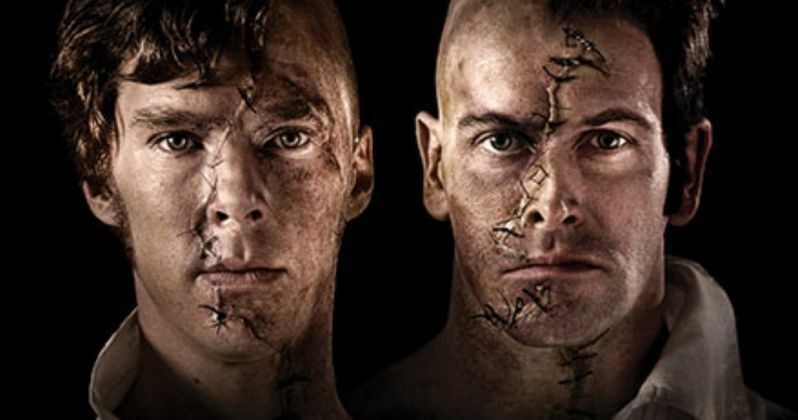 Frankenstein features Benedict Cumberbatch (Hamlet, BBC's Sherlock) and Jonny Lee Miller (Elementary, Trainspotting) alternating between the roles of Victor Frankenstein and his Creation. Yes, it will almost, kind of be like dueling Sherlocks, but not really. Scientific responsibility, parental neglect, cognitive development and the nature of good and evil are embedded within this thrilling and deeply disturbing classic tale. Fathom Events, National Theatre Live and BY Experience have partnered in the past to bring Hamlet, Julius Caesar, and Macbeth and more to movie theaters across the nation. Upcoming titles from the current live series include King Lear (September 27) and Antony & Cleopatra (December 6). When is this exciting live theater turned movie multiplex experience happening? Just before halloween on October 22, 2018; 7:00 p.m. local time (Cumberbatch as Creature) and October 29, 2018; 7:00 p.m. local time (Miller as Creature). Where can you get tickets for Frankenstein? They can be purchased at www.FathomEvents.com or participating theater box offices. Fans throughout the U.S. will be able to enjoy the event in nearly 500 select movie theaters through Fathom's Digital Broadcast Network (DBN). For a complete list of theater locations visit the Fathom Events website (theaters and participants are subject to change). You loved him as Dr. Stephen Strange in Infinity War. You couldn't get enough of him as Kahn in Star Trek: Into Darkness. Now, see everyone's favorite Grinch as he transforms once again into the scary creature known as Frankenstein's monster.